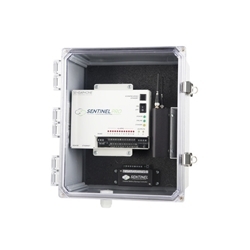 The Sentinel PRO Monitoring System with Cellular Modem offers an easy-to-install, easy-to-configure monitoring solution for locations with no access to a landline or Internet connection. The cloud-based Sentinel PRO allows you to monitor remote facilities and environments and check critical conditions of your climate-sensitive commodities with the same degree of certainty you’ve come to expect from Sensaphone. The system monitors, delivers alarms, and datalogs input/output points from third-party Modbus sensors, transducers and programmable logic controllers. The system supports Modbus RS485. It takes the burden out of managing your system by giving you access to your readings from anywhere using a simple, powerful web-based interface. If there’s a disruption, you’ll be the first to know. Alerts can be sent straight to your mobile device—keeping you updated and giving you peace-of-mind wherever you are so you can remain focused on business as usual.